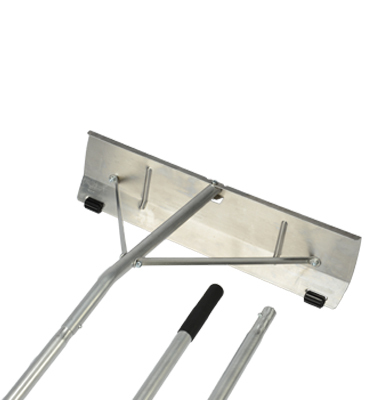 By far the best roof rake on the market with its exclusive, patented, "Shingle Saver" rollers. This unique snow flake roller design is easier to use because the blade never touches the roof's surface, preventing damage, while making it easier to roll back up the roof. By using the 21' Roof Snow Rake to safely remove snow from roofs, home owners can prevent the damage of much-publicized ice dams. Ice dams cause water to back up under shingles, ruining roofs, ceilings and walls. Removing snow also relieves unnecessary weight on the roof which can damage the eaves.